As a web professional, it is very exciting for me to see the continued growth and vibrancy of Refresh the Triangle. The February meeting happened last Thursday (February 28th) and we had more than 40 people show up, packing first-time sponsor iContact's meeting room. 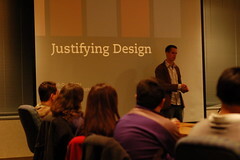 After the traditional meet-and-greet, Rob Goodlatte gave an excellent talk entitled "Justifying Design," which was challenging to the designers in the audience while being accessible to the developers and others in the audience. The principles he shared were good guideposts for designing within the rapidly-changing aesthetics and building blocks of the web. iContact was gracious to let us have a longer social hour after the meeting in their office. The Refresh after-talk is quickly becoming one of my favorite conversational and networking opportunities in the Triangle. If you haven't been yet, I definitely encourage you to join the mailing list and come to the next meeting.